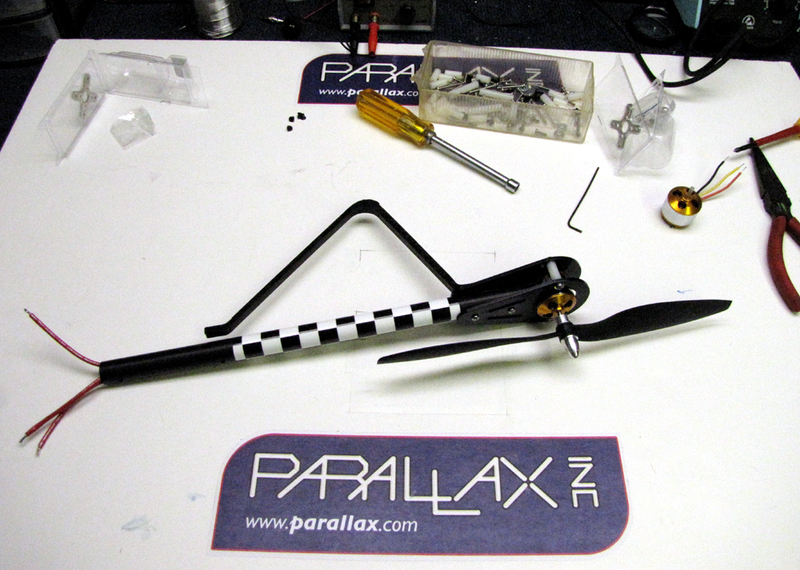 I started building the Parallax Elev-8 Quad Copter this week! In this first video I do a step by step build of the motor and boom assembly. The ELEV-8 quadcopter is a flying robotic platform that is lifted and propelled by four fixed rotors. There are no fixed wings; all of the lift is created from the rotors. Unlike standard helicopters a quadcopter uses fixed-pitch blades, whose rotor pitch does not vary as the blades rotate; control of vehicle motion is achieved by varying the relative speed of each rotor to change the thrust and torque produced by each. The quadcopter uses a HoverFly board with a Propeller multicore microprocessor to electronically control stabilization of the aircraft. The benefits to this system are a stable platform, with no mechanical linkages for a small maneuverable and agile aircraft. The kit provides an inexpensive way to get involved in the quadcopter arena. The kit includes; frame, mounting hardware, motors, speed controllers, propellers and the control board for flight stabilization. (the only thing you need to provide is the RC radio equipment, battery). We recommend a six channel RC radio. NOTE: This kit is not for beginners, it takes a moderate amount of mechanical skill, for building and flying. The ELEV-8 quadcopter kit requires an average of 8 hours to assemble; RC experience is highly recommended.